This past weekend I had the pleasure of having one of my closest friends from high school, Julia, over for dinner. She’s been living California for the past year, and I haven’t gotten the opportunity to spend much time with her. In fact, I’ve seen less and less of her every year since we graduated from Durham School of the Arts. We had so much to catch up on and I’m so glad she was able to come and stay. On Sunday Dan and I got up and went to the farmer’s market, which was fuller than we’ve seen it in months. 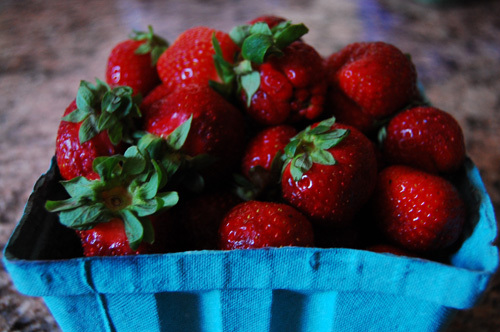 We picked up fresh strawberries and green tomatoes, and Sunday night we had a fried green tomato and arugula salad, steak with avocado sauce, and a cornmeal cake with strawberries. It was all fresh and delicious, and paired with mojito after mojito it all seemed better and better. At some point in the evening Julia noticed our high school year books that I recently recovered from my parent’s house. I had so much fun looking at the pictures, reading some of the (ridiculous) things that we wrote and remembering how passionate we were about everything from Jump, Little Children to saving the world (one Environmental Club meeting at a time). If my parent’s were looking for someone to blame for my becoming a democrat (read “communist”), it would be the hours I spent with Julia debating our world view and developing our moral and political opinions. Since we moved to D.C. where I don’t really know anyone, I’ve become increasingly aware of how strange it is not to have female friends in close proximity. Having Julia here last weekend was such a strong reminder of what it’s like to have female friends in your life that you see on a consistent basis. From the ages of 15-20 we did everything together. Johnny Depp movie nights (Don Juan DeMarco is our favorite, The Man Who Cried was hands down the worst), trips to Charleston to see the Dock Street Concerts by JLC, hundreds of nights spent staying up all night talking about boys, politics, religion, music, and of course, the genius that is When Harry Met Sally. I was looking for a good photo of Julia and I from high school to end the post with. There’s one particularly good one of us on the bus where we first met, but while I was looking for it I stumbled across this masterpiece. At some point in our high school photography career, Julia and I had a photoshop project. And, as you can see below, wow we championed that program. The assignment was either to combine two things or combine two people, but I can’t remember. 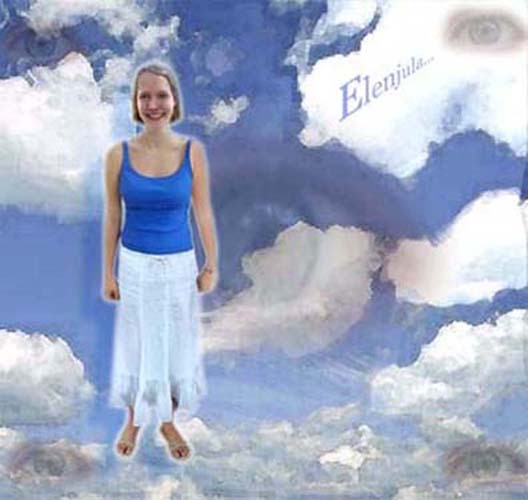 Clearly we opted to combine photos of ourselves to create a new and improved model- Elenjula. I’m taking the creepy floating eyes in the picture to mean that we intended Elenjula to be omniscient. You’re so welcome. 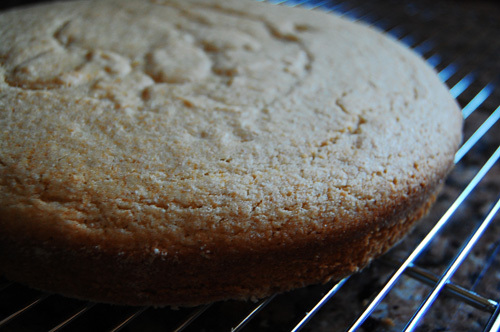 Butter the bottom and sides of a 9″ cake pan. Line the bottom with wax paper and butter the paper. 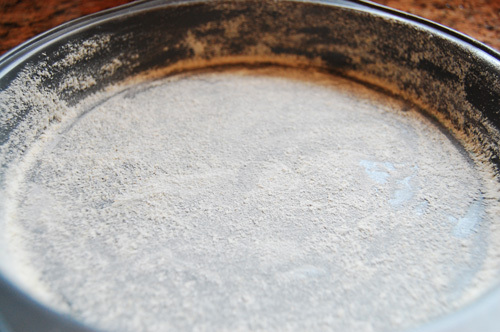 Dust the pan with cornmeal, shaking out the excess. Stir together flour, cornmeal, baking powder, and salt. 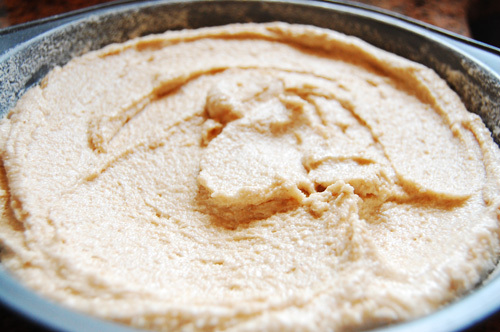 With a mixer, beat butter until creamy. Add sugar a little at a time and beat until creamy and light. Add eggs, one at a time, incorporating each completely before adding the next. Add lemon zest. Whisk together milk and vanilla extract. Begin adding the dry ingredients and milk to the butter mix, alternating so that you add the dry ingredients a third at a time. Use the mixer to blend them until they’re just incorporated. Spread batter evenly into pan. Bake at 350 for 35-40 minutes. Let cool in pan for 20 minutes, and then let cool on a rack until room temperature. Hull the strawberries. Put half of them in a large bowl and crush with a masher. Slice the remaining strawberries and add to the bowl. If they’re not sweet enough, you can add a touch of sugar. Add enough lemon juice to give the mixer a refreshing edge. Cover and chill. When you’re ready to serve, whip cream and sugar until soft peaks hold. Cut the cake into portions and transfer onto plates. Top with berries and whipped cream. Wow…I don’t think I’ve ever had cornmeal cake before! Very interesting. 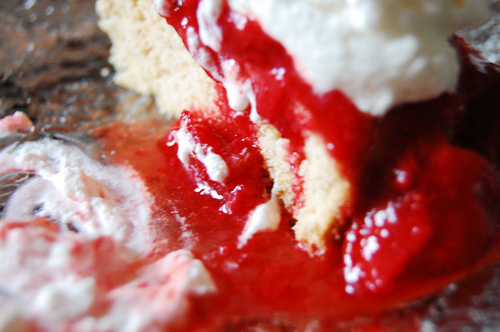 Looks so good with the strawberries and whip cream – great photos! If you don’t mind I’d love to direct Foodista readers to your blog. Just add your choice of widget to this post and you’re all set! Great, thanks! Happy to link back to Foodista.